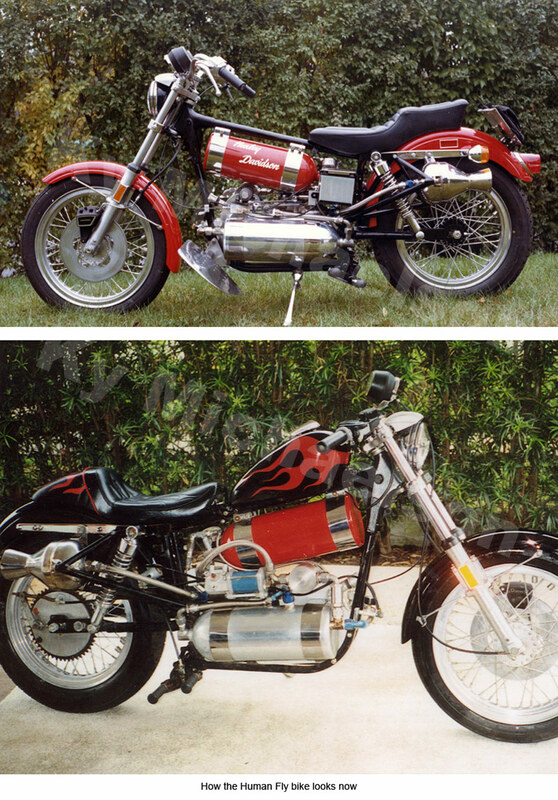 In 1977, I was contracted to build a rocket-powered motorcycle capable of jumping over 27 buses. The jump was to take place in the Montreal Olympic Stadium, as a half-time show for a concert featuring Gloria Gaynor and a number of other disco stars of the 70’s. The daredevil rider was Rick Rojatt, otherwise known as the Human Fly. At the time, Evil Kneivel held the record jump of 13 buses, and Rick wanted to beat it badly. 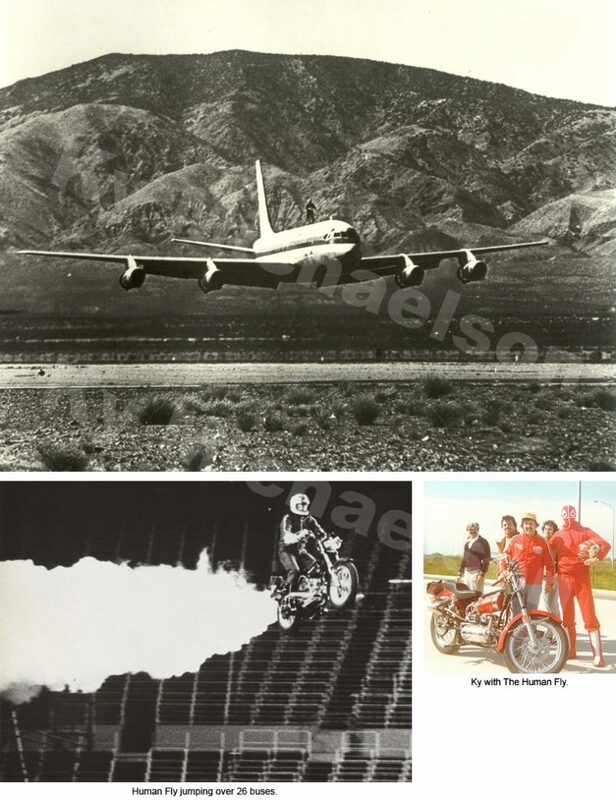 Rick’s claim to fame at that point in his career was an astonishing stunt he’d performed over the Mojave Desert where he’d wing-walked on a DC-8 and actually made two low flying passes at 250 mph, a nearly impossible feat, and truly death-defying. The other very unique thing about this off-the-wall daredevil was that he was never seen out of costume, and kept his true identity a secret by wearing a red mask and a white cape, identical to the comic book action hero. From the moment I met this guy, I was convinced he was an accident looking for a place to happen, especially when he told me he wanted to attempt 36 buses. I managed to convince him otherwise when we discussed the fact that in order to do something that remarkable, he’d have to hit the jump ramp at well over 100 mph, and continue to burn the rocket a couple more seconds after take off. I explained that it was definitely possible, but the fact remained that acceleration of that magnitude in such a small area would launch him head-first through the concrete pillar at the opposite end of the arena. That conversation resulted in his finally accepting the challenge for 27 instead. He’d still have to travel at 80 mph, and it wasn’t that there wouldn’t be a crash, for I was certain there would be. It was just a matter of how bad it would be by the time he reached our nets and a huge airbag we’d have set up. I knew the decrease in speed and thrust would make a huge difference, and I felt we could pull this one off with minimal damage to the bike or to Rick (hopefully). The guy was determined, and since my business at the time was working with stunt people, daredevils, and people with death wishes, I remained intrigued and as optimistic as possible, praying I wouldn’t fall witness to the hand of death “swatting” the Human Fly. I became even more concerned when I received a phone call from an insurance broker, Bruce McCaw, who called to thank me as he told me I was responsible for throwing a lot of business his way. When I asked him what he meant by that, he told me he’d just issued a life insurance policy on the Human Fly, and that Lee Taylor had been a client of his, as well. That really got me thinking. As we prepared for this stunt, it soon became obvious that one of the biggest challenges we faced was the space constraint in the arena; there was no room to accelerate to the speed required, so I came up with a plan. I’d build a rocket-powered motorcycle that would sit right at the bottom of the ramp instead of making the usual fast and furious approach. All the Fly would have to do was get on, wave to the crowd, press the button, say a quick prayer, and hang on for dear life!! Rick liked the idea, and agreed to try it, so he sent me a brand new 1977 Harley Davidson XL-1000 Sportster, a true black beauty, to build from. I put exactly three miles on it, and then the fun began. I yanked out the engine and built two 1,500-lb. thrust hydrogen peroxide rockets, which I mounted one on top of the other, directly underneath the fuel tank. Other than the two polished stainless steel rocket motors hanging off the back of the bike, I left everything else intact, including the headlight and taillight, to make it look completely stock. By the time I finished, this refined machine boasted 6,000 HP. In other words, if a guy were to take this thing out to the local drag strip, hold the throttle wide open, and hang on hoping the tires didn’t fall right off? He’d be capable of going well over 300 mph in the ¼ mile. I let Rick know the bike was ready, so we delivered it to Montreal. We all met up the day before the big event, delivered all the equipment, and met with the promoters to discuss the plans. They had hired contractors to put the jump equipment together for us, which I wasn’t real happy about, but finally agreed to. We went over the stunt as thoroughly as possible, and much to my amazement, Rick didn’t want to do any practice runs at all. He just sat on the bike, admiring it, determined to just wait until the time came. I gave him step-by-step detailed instructions on how to operate the rockets, and he just took it all in, nodding as I went along. I knew he understood what I was saying, but I hardly slept that night because I was always so safety conscious, and typically rehearsed stunts many a time before actually performing them. I was uneasy with this particular situation. Jim Deist, Dar Robinson, and I arrived at the arena bright and early. Much to our surprise, we could clearly see that the blueprints for both the jump and receiving ramps were obviously not adhered to, as there were major flaws in both of them. The jump ramp was much too steep, which would cause the rocket bike to come off it at the wrong angle and stall. I was even more concerned about the receiving ramp, though, as the last ten buses were supposed to be covered by plywood extending to the ramp. What we found instead was a plywood ramp that was about six feet above the buses, with exposed steel cross members. I told the promoters that their contractors, or whoever it was that built these things, obviously didn’t follow the blueprints we’d provided, and I was not going to fuel up the rocket bike until major changes were made to the receiving ramp. I won’t go into a lot of detail here, but it did turn into a major ordeal by the time we did our last safety inspection, which forced the Showtime to change quite a bit. That was not to be, though, and as the promoter announced the stunt, and he took center stage in full costume, the crowd went absolutely wild. I stood in awe as he hopped on the motorcycle, waved to the crowd, looked over at me, gave the thumbs up, turned on the safety switch, and slowly opened the throttle. The rocket bike started up the ramp slowly at first, and then the Human Fly pinned the throttle wide open. The cloud of smoke was a sight to behold in the nearly pitch dark arena. The super-heated steam shot out the back as the bike climbed up the ramp and instead of launching forward into the air, went much higher than it should have, and nearly straight up. Because of the wrong angle, it stalled when he let off the throttle, and the rear end dropped, nearly arching the bike completely backwards as it hit the receiving ramp hard, before then crashing down on him. My heart just pounded as I stood there, witnessing the crash of all crash landings right before my eyes, and a hush fell over the crowd, as we all feared the worst. It looked like nobody could have possibly survived such a crash landing. We were soon relieved though when we realized he was actually okay. He’d survived the crash, and he’d done it-he had broken Evil’s record, but not without paying the price. He waved to the crowd as he was carried off on a stretcher, suffering a broken ankle and a couple other injuries. *Now, if you ever want to hear more details about this story, just buy me a Diet Coke the next time you see me, and I’ll be happy to share one of the most bizarre events of my life with you. That jump, and my rocket bike, went down in the history books and then, as things work out, I lost track of both the Human Fly and the bike. I’m happy to say, however, that this story has a rather unique ending. Even though I had long since gotten over owning that fine machine, I received a call not long ago from a stuntman friend of mine, Bubba, a renowned and darn good motorcycle jumper himself, with some astonishing news. He told me he had picked up a “Trading Times” magazine while he was in Florida, and was dumbfounded when he spotted a motorcycle in it that he could have sworn was my original rocket bike. He gave me the phone number, and I immediately contacted John Werner, the owner, who attested and confirmed that it was in fact the bike used in that incredible stunt. I told him to name his price; I wanted it back, and BADLY, so he agreed to sell it back to me for $6,500. I sent a good friend of mine down to pick it up, and am pleased and proud to say it is now resting back in my rocket shop where I built it some 23 years ago. They had it rebuilt after the crash, and it looks good as new, in great shape.The only thing they changed was to ad a gas tank. I find myself just staring at it frequently, and reminiscing back to that history-making event quite often. I’m happy to say that if you ever hear of anybody looking for a bike that can jump 27 buses? I’ve got just the thing, but there’s one condition! They need to see a psychiatrist first.